A Turkish mob forced Israeli basketball players to flee the court today. They even burned the Israeli flag. Players from Israel’s Bnei Hasharon basketball team were forced to flee the court today in Turkey after protesters chanted and hurled lighters and coins at them. The Turkish team was awarded the victory after Bnei Hasharon was considered to have forfeited the game. A Eurocup basketball match was called off in Ankara as the visiting Israeli side did not bother to return to the court after Turkish spectators launched anti-Israeli protests, prompting riot police to intervene. 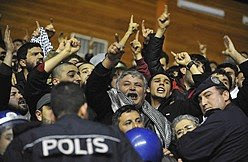 “Israeli murderers, get out of Palestine,” “Allah-u Akhbar” (God is great), the protestors chanted as the teams – Israel’s Bnei Hasharon and Turkey’s Turk Telekom – initially came out for the match in the Ataturk Sports Arena. The Israelis returned to their locker room after a group of protestors, some carrying Palestinian flags and wearing the kaffiyeh – the traditional checkered Arab scarf – hurled coins and lighters at them and attempted to invade the court, prompting police to use truncheons to stop them. The spectators were then asked to empty the hall, but several dozen people refused to leave and their exit was secured only with a false announcement that the match had been cancelled. The referees then called the two teams back to start the game, but the Israeli side did not show up. Turk Telecom, leaders in Group D, is expected to be awarded victory, with Bnei Hasharon, stuck at the bottom, considered to have forfeited the game by not fielding a team.